I just love Peking Duck. But what do you do when you live approximately 12 270 miles from China’s old capital Peking – now known as Beijing? Well, you make a plan. I had to, the last time my hubby saw the duck hanging in my kitchen he thought I had turned into some or other crazy woman! Look … fine-tuning Peking Duck has taken many hundreds of years to perfect. It has its origins in Imperial China and I can in no way replicate such an art, let alone go through the pure hard work of kneading and pressing the dough to make their little traditional pancakes (I have done it before … and my palms got a good beating). Take two duck breasts and fry them skin down in a non-stick frying pan. Fry until the skin is crisp and golden brown. Do not over fry – I like my duck pinkish. And then … instead of sweating and toiling over the traditional pancakes (this being said with the greatest respect to the Chinese .. their culture and mastery of the culinary arts), go out a buy already made mini roti’s which you can use as the “pancake” (you can buy these at any good supermarket). Heat them up in a non stick frying pan – then add your sliced duck + julienned cucumber + spring onions slices and sprinkle with an easy hoisin-based peanut butter sauce with a bo-kaap twist, add a bit of chopped coriander … And Voilà, there you go – the juiciest + loveliest + untraditional Peking Duck … Bo-Kaap style! “Wèikǒu hǎo”. Arrange the breasts skin side down in a large, heavy skillet set over medium-low heat. After a few minutes, the skin will begin to melt. Cook about 6 to 8 minutes, until the skin becomes crisp and brown and a great deal of the fat has rendered out. Turn them over, increase the heat to medium high and cook 2 to 3 minutes, until the bottom is brown and the breasts feel springy to the touch. While the duck breasts are frying, cut your vegetables and heat up your roti's. Then all you do is slice the duck breasts obliquely into thin even slices and add to your warm roti. Place some veggies on top and sprinkle with the sauce. Yummy! I think for me Easter has always been different to the somewhat traditional religious Easter festivities, you know the Friday fasting, the curried fish, chocolate eggs and Easter Sunday feast…. You see, my father was the station master at Wepener in the Free State for many years and once a year the South African Railways would give its employees and their families a free rail ticket. So every year, my mom, dad, three brothers and me would take the train down to Durbs for our Easter school holidays. It was such an adventure for us because Durban was fun … there was sun + beaches + sand. It was singing on the stages trying our best to win prizes, fighting with my brothers, building sandcastles in the sand with dad, swimming in the ocean with mom and losing ourselves in the summers of our youth. For the short few days we spent there we lived on ice cream and sandwiches during the day, but at night when we were all sunburnt and after a long soak in a soothing bath, my mom used to make us fresh fish and salad for supper. The fresh salmon salad I made today is a dedication to the happy memories of those Easters past and to my folks for affording us this once a year seaside adventure. Apart from the salmon and the avocado, I got all the ingredients for the salad out of my garden. Instead of placing the salmon on top of the salad as it is usually served I decided it would be more fun to put the salad on top of the salmon – and I must say I think it looks amazing! It would be unfair for me to dictate the quantities of salad ingredients you should use as this is best left to your own discretion and mood. I also like my salmon somewhat rare, so I prepared it that way. But the thing that really adds to the overall pop-up-flavour is the rather delicious lime and soya Asian dressing. So here’s to family, Easter, lasting memories and fresh food. Blessed Easter everyone! Fry your salmon for three minutes with the skin side down in a non-stick pan till skin crispy - say about 5 minutes - don’t turn it around and don’t season at this stage and let it stand to rest. The intention is to serve it luke warm not piping hot. Chop up all your salad ingredients and make your dressing by mixing everything together. Now just place this beautiful cut of fish on a plate. Place the salad on top and put the dressing on the side. I don’t add any salt at this stage and leave it to the guests to decide how much salt they need because the dressing is quite salty. On Spring Day I found myself reading an article posted on the Independent Traveler site written by Lori Sussle – “12 International Foods to try before you die” – it’s kind of like a “food bucket list” for us ordinary people [see the full list below]. The first item on the list was Vietnamese Spring Rolls or Fresh Spring Rolls. Spring Rolls are normally associated with the freshness and vitality that comes with the onset of Springtime and are versatile, healthy and easy to make. 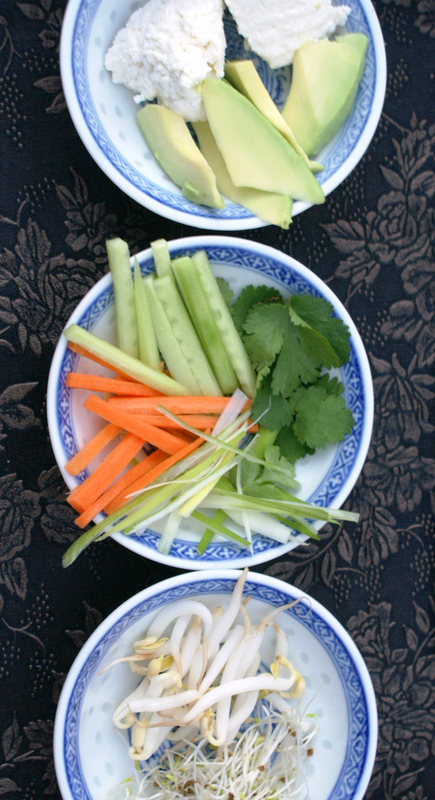 You can prepare either vegetarian Spring Rolls or add seafood or even meat and eggs, whatever your heart delights – but the most important thing for me when serving a fresh spring roll … is the dipping sauce. The sauce needs to compliment the ingredients inside the roll – you can make peanut sauce, soy based sauce or sweet and sour sauce etc. I decided to make spring rolls with ricotta cheese and my own dipping sauce – yip – I think the foodies will tell you that it is somewhat of a no-no to fuse Italian with Eastern cuisine. Well it worked – East meets West … its delicious and the ricotta adds a lovely creaminess to the roll. In my recipe I cannot specify the quantity of ingredients you will need as this depends on how many Spring Rolls you would like to make or how “fat” you would like to make them…but I have included a list of suggested ingredients with a link to a YouTube video which shows you how to make your own fresh spring rolls. 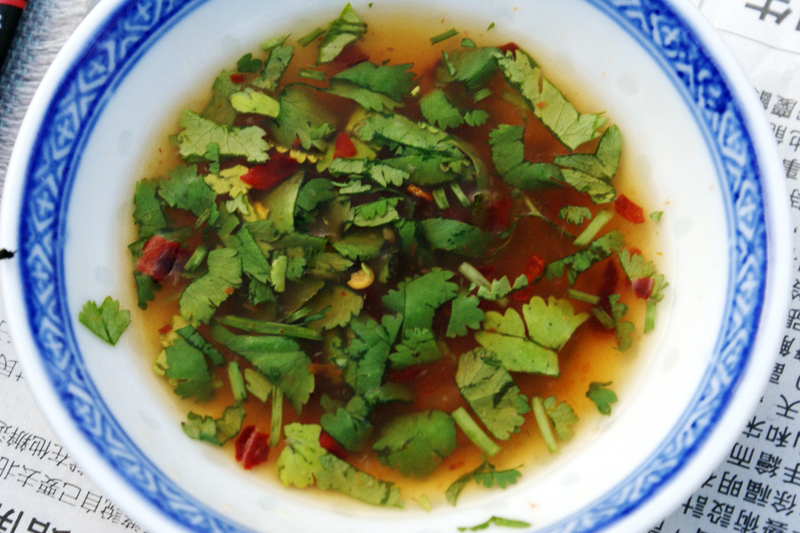 Try my dipping sauce – its fresh, salty, sour and sweet all at once and adds just another dimension to eating this Eastern treat. An accidental tourists’ culinary bucket list …. 1. Vietnamese Spring Rolls – fresh spring rolls is a Vietnamese delicacy known as gỏi cuốn. 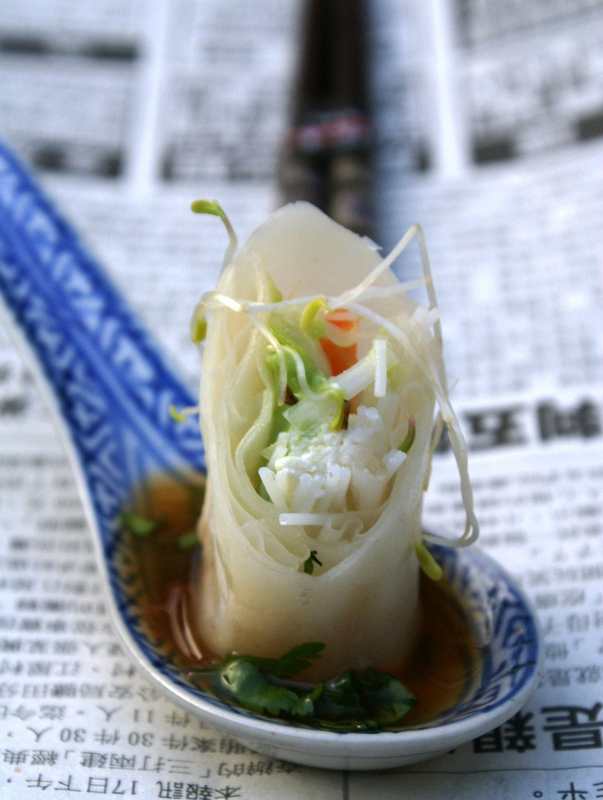 Depending on the region, spring rolls are made in different manners with different ingredients. 2. Gnocchi – come in various shapes and guises and are soft dumplings made from semolina, ordinary wheat flour, potato and egg. 3. Meze – is a selection of small dishes served in the Mediterranean, Middle East and Balkans as either a breakfast, lunch or even dinner – with or without drinks (I prefer it with drinks… ). In Levantine cuisines and in the Caucasus region, meze is served at the beginning of all large-scale meals. 4. Lobster Roll – a traditional lobster roll that contains the fresh cooked meat of a lobster, tossed with mayonnaise and served on a grilled hot dog bun or similar roll, so that the opening is on the top rather than on the side. 5. Churros and Chocolate – a churro, sometimes referred to as a Spanish doughnut, it is a fried-dough pastry—predominantly choux-based snack. There are two types of churros in Spain, one which is thin (and sometimes knotted) and the other which is long and thick (porra). They are both normally eaten for breakfast dipped in hot chocolate or café con leche. 6. Kangaroo meat – is a meat from any of the species of kangaroo. It is produced in Australia from wild animals. 7. Saag Paneer– is an Indian and Pakistani dish consisting of spinach and paneer (Indian farmer’s cheese) in a thick curry sauce based on pureed spinach. 8. Ćevapčići – is a grilled dish of minced meat, a type of kebab, found traditionally in the countries of southeastern Europe. 9. Poutine – is a French Canadian dish, made with French fries, topped with brown gravy and curd cheese. 10. Completo – is a hot dog variation eaten in Chile, which, is usually served with ingredients such as chopped tomatoes, mayonnaise, sauerkraut, a variation of the sauce américaine, chilean chili, green sauce and cheese. It is normally a lot larger than the American type of hot dog we have come to know. 11. Queso Helado – is reminiscent of frozen rice pudding flavored with cinnamon. Some say it’s like creamy shaved ice. It’s made from sweet milk with a touch of coconut or cinnamon. 12. Ktefa – traditional Moroccan dessert made by layering fried or baked warqa pastry with sweetened fried almonds and custard sauce flavored with orange flower water. Dipping Sauce: Mix all ingredients together.